Structurally, CAT 2018 was on a similar line as it was in CAT 2017. However, compare to CAT 2017, the Quantitative aptitude section of CAT 2018 was difficult and the LRDI section in CAT 2018 gave some relief to the aspirants. Still, the difficulty level of LRDI section was moderate to difficult. VARC section was also moderate. 1 RECYCLING OF PLASTIC IS NOT THE SOLUTION BUT PRODUCTION OF THE SAME IS THE PROBLEM Passage says that non-degradable pastic is bane for environment. We use it for approx 12 min as carry bag however it takes many years to degrade. Author says that make America Beautiful campaign by Coke, Nokia & other companies is also a hoax in a way because it just diverts people’s attention from main issue and shifts the guilt of environmental mess on to the shoulders of consumers. 2 INDIAN GOVT. SPONSORED INTERNATIONAL COMPETITION TO DESIGN NATIONAL MONUMENT Indian Govt. is conducting an International Competition to design NATIONAL MONUMENT for soldiers who lost their lives in the wars of pre-independence era. This monument will be made beside Delhi’s India Gate. 3 ELEPHANTS ARE BECOMING AGGRESSIVE If human beings suffer in their lives or get deprived of certain basic amenities then they get aggressive, it’s natural. 4 EPIGENETICS MODIFICATIONS – A STUDY ON MICE Emory University Atlanta has conducted research on the behaviour of mice & their offsprings. 5 HAPPINESS NO LONGER A PHILOSOPHICAL PHENOMENON BUT A SCIENTIFIC TRUTH. Happiness is no longer just a philosophical or romantic subject rather it has become a scientific & biological issue. Even Economists can’t see this subject in isolation. Advance in science and neurology has empowered humans to even understand that happiness is caused by certain chemicals reactions happening in hemispheres of brain. Happiness of a person can be measured through our facial expressions, pulse rate, wearable devices and our behaviour in social media. Monthly Sales, Quarterly Sales, Yearly Sales were given of LED TVs of last two years 2016 & 2017. (1 set) An ATM dispenses Rs 5000 in denominations of Rs 100, 200, 500 notes. It prompts customers to enter their desired denominations. The second slot of CAT 18 was no different from the first slot. 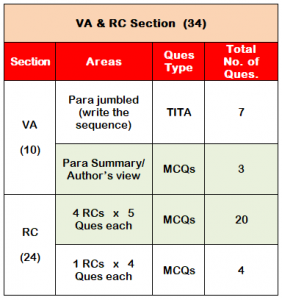 The VARC section had similar structure, pattern and question distribution. 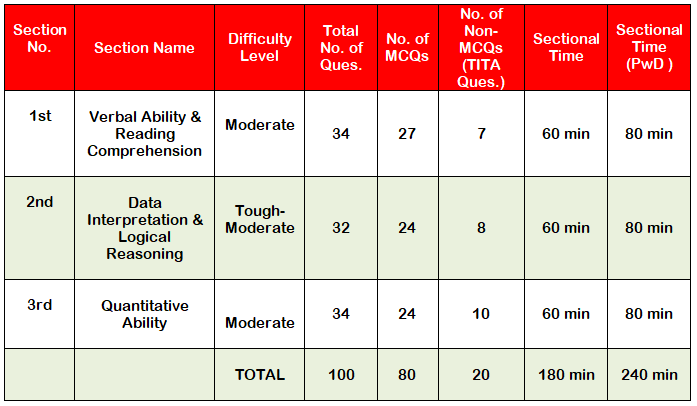 While most pundits felt that the LRDI section in the second slot was of a slightly higher difficulty, the quantitative section according to most was very similar to the one that came in the first slot. Let’s go through the microscopic analysis of the three sections. The VARC section had 10 questions from Verbal Ability, comprising three questions from Summary, two from Odd Sentence and four from jumbled paragraph. The questions from jumbled paragraph were slightly difficult as the options were short and similar to another. Similarly, the three questions from Odd Sentence were slightly tricky and would have taken a good amount of time. The surprise was TITA (Non MCQ) parajumbles, which had only four sentences that were easy to read and understand. Students found two parajumbles to be easy, while two were of moderate difficulty. In short, students could have managed a decent 6 out 10. Students who went with the preconceived notion that non-MCQ parajumbles are difficult would be at a little disadvantage. The RC section had a slight structural change; instead of three long RCs having six questions each and two short RCs having three questions each, the section had four average length RCs having 5 questions each, and one RC having four questions. The Reading Comprehension passages that came in CAT 18 were remarkably different from the ones that students came across in their mocks. The CAT RCs were readable and were from areas familiar to students. The questions were based on: inference, suggestion, central idea, strengthening and weakening of author’s argument etc. We realized that the RCs were slightly more difficult than the ones that came in CAT 17. In CAT 17, the RCs had a good number of direct questions, while in CAT 18 there were plenty of questions that tested the students’ critical reasoning skills. Also, we observed that comprehending and understanding the central idea was key to answering most of the questions. Without understanding the central idea, one would have most likely marked wrong options or could have got a few questions incorrect. The other thing that we observed was that the passages came primarily from science and environment and, technology and management. It makes sense to have such passages because these kind of passages demand comprehension and understanding, and thus the test takers VARC ability can be better tested through such passages. A score of 48-50 would be good enough for 90-94 percentile. A score of 55-60 is likely to fetch 95-98 percentile, and a score of 65 and above might get you 99 percentile. The LRDI section was of a slightly higher difficulty than the one that came in the morning slot. There were two easy, two moderate, and four high difficulty sets. Thus picking the right set was very important. The set with 2016 sales data was not difficult and could have been managed by the students. The set that had seven people arriving for interviews at different times and waiting in different rooms was also quite manageable. There was a slightly high difficulty set theory based caselet. The one on code “PEACOCK IS…” was both difficult and time consuming. The ranking of colleges based on weighted scores also was difficult and time consuming. To cross 85 percentile, you should have solved at least two sets correctly. Three correct sets are likely to result in 95 plus percentile, and four or more than four correct sets is likely to result in 99 plus percentile. The biggest surprise was from this area. Geometry is likely to decide the final outcome for most students, not because many questions came from geometry but because there were quite a few easy questions that came only from this area. The questions (around 6 in number) were based on simple formulae and straightforward concepts. When overall difficulty of the paper is high, the easy questions decide the percentile. The questions from numbers were difficult, whereas the questions from arithmetic were time consuming and calculation intensive. The questions that came from functions, log and progression were not a cakewalk. Thus, the quant section can be said to be of a high difficulty, with barely 10 to 12 questions falling in the easy to moderate category. A score of 40 is likely to fetch you 90 percentile. A score of 50 will take you beyond 95 and score of 60 plus will definitely result in 99 plus percentile. Why does India fare miserably in the Olympics ?